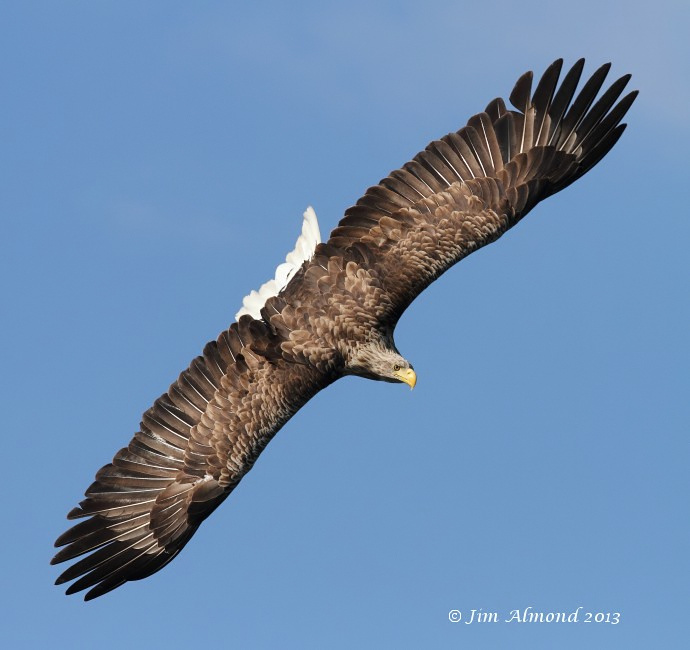 Jim Almond recalls a sunny day in mid-August hoping to capture some memorable White-tailed Eagle images. Bird flight photography is not just about using a long focal length lens (500mm or more) and if hand held, giving yourself backache in the process! There are situations when a smaller focal length lens comes into play, notably when birds are flying close by or for large subjects. An additional bonus of using such a lens will be faster autofocus and less strain on the body, making hand held photography an easy proposition. 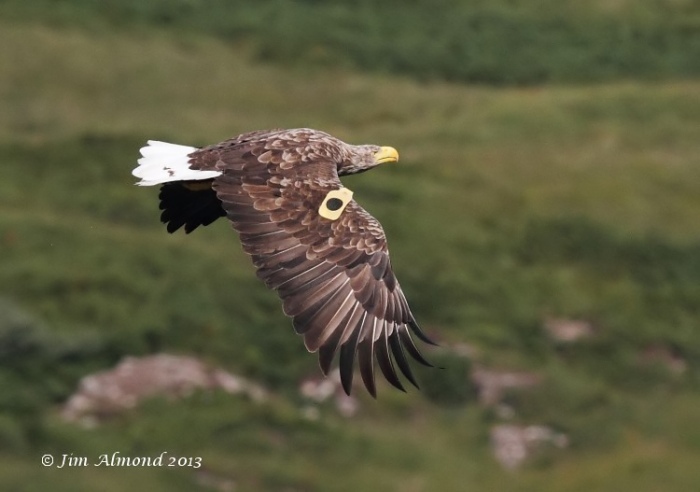 I use a 500mm lens, often coupled with 1.4x extender for the vast majority of my bird photography but a trip to Mull in August 2013 gave me an ‘opportunity’ to give my 300mm f.2.8 lens an outing! It isn’t the lightest lens in my armoury, weighing in at just 2.4kg but feels as light as a feather after using its bigger brother and is so ‘snappy’ with the autofocus. The opportunity came in the form of an encounter with a real frame filler of a bird, White-tailed Eagle, not just large but conveniently close as well. 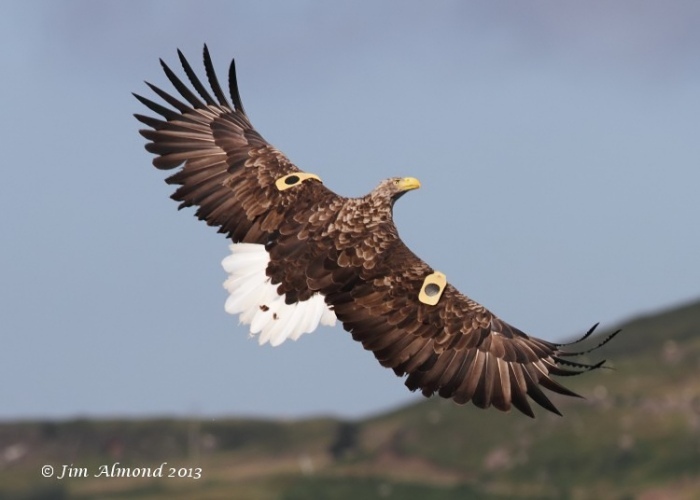 Mull Charters offer daily boat trips (weather permitting) to see/photograph these birds and with the prospect of an easy meal on offer, the Eagles come looking! 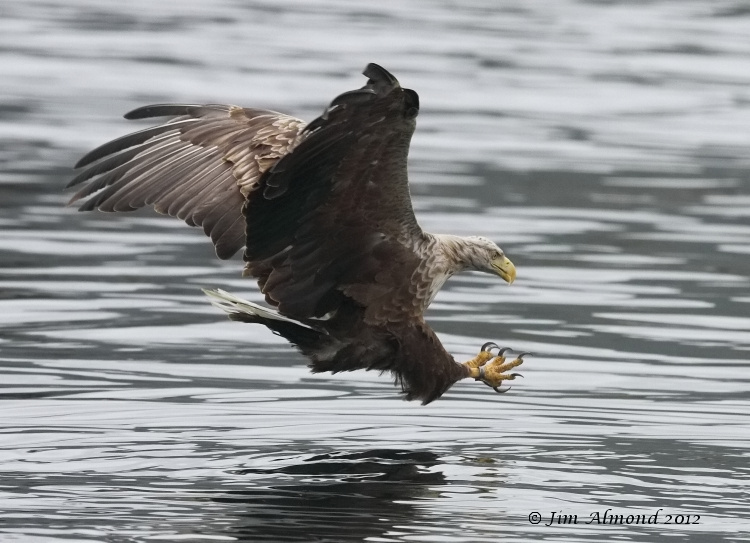 My previous encounter with White-tailed Eagles was in gloomy conditions, so as the boat left Ulva Ferry with a good percentage of blue sky on offer, I was justifiably optimistic. We didn’t have long to wait before the first eagle showed interest…… ....…… With such good light, I was able to work with a shutter speed of 1/4000 sec and used an aperture of 6.3 most of the time, given the proximity of the eagle, a little extra depth of field helps. Blue sky and sunshine introduce an unwelcome factor however - high contrast! It is best to bide ones time until the bird is evenly illuminated, ideally side lit. Even with mid-morning sun, the first picture shows what can go wrong - the underwing totally lacking detail. Keeping the bird in the centre of the viewfinder and with finger poised over the shutter, it’s a question of being patient (and quiet) as the Eagle starts to lose height and make a close approach. Be ready for anything at this stage, they can sometimes flip upside down but will normally bank at some stage, it is crucial that sun is falling on the bird evenly and you are not pointing into the light! When everything clicks into place, the results can be quite stunning. As the eagle loses height and starts to fly on an approach to the intended meal, the action suddenly starts to accelerate, don’t panic! Pan smoothly with the bird, firing images all the way but trying not to lock the camera buffer up. The camera was set on AI Servo and autofocus set on expansion mode, the extra autofocus points ensure you are less likely to ‘lose’ focus on the bird. At this point, the eagle had come from an awkward angle in front of the boat and I lost it behind a sea of heads, luckily grabbing an image or two as it plucked a fish out of the water. A close encounter indeed, this image is virtually uncropped. The action isn’t confined to the arrival and ‘catch’ moments, keep concentrating as the eagle leaves and watch out for anything unusual. 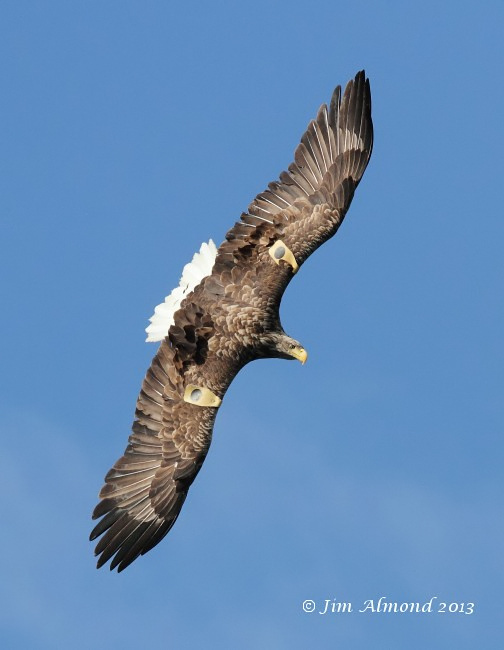 As the eagle gains height and is flying against the land, it is imperative to keep the focus points on the bird, it is so easy for the camera to pick up a distant hillside! Be ready for any unusual manoeuvres? 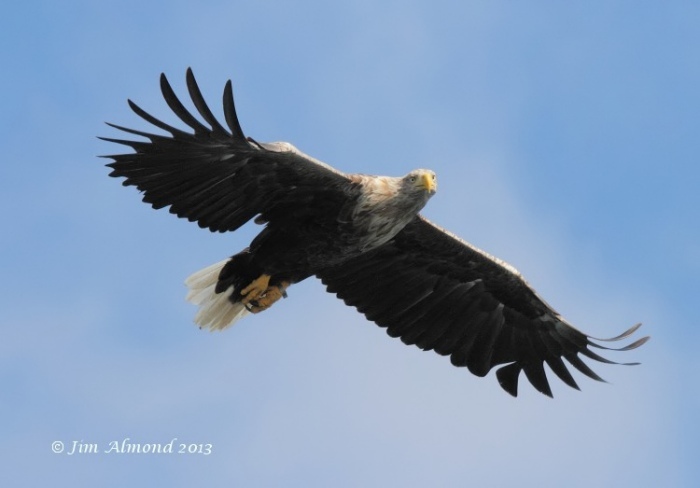 The female eagle dropped her fish whilst flying off and rather than holding a straight flight path, suddenly reared up and banked to gain height. Capturing a moment you (or others) don’t normally achieve is guaranteed to give the image extra appeal. What better way to finish! 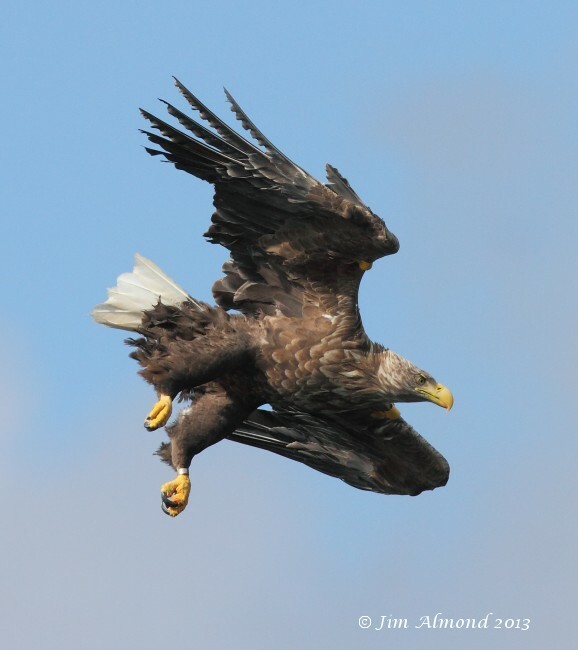 The female eagle banking whilst beautifully lit and a moment I will not forget in a hurry! Some tips for getting the best out of this type of trip. Book early - even before you travel to the area! Places are snapped up and waiting for a ‘nice day’ means you may not be on the boat? Try and get a position free from obstructions, aim for the rear corner of the boat. Forget your tripod or monopod, hand holding your gear is a must. DON’T use a long lens, unless you are after a particular close up). 300mm focal length is optimum for me with a Canon 7D but a zoom or fixed lens covering the 150 – 300mm range is ideal. Practice on gulls while you are waiting, ensure your exposure is spot on and get into the rhythm of steadily tracking them in flight. Check you have a large capacity card in the camera and don’t waste space in the early stages, when the eagle is distant and poorly lit. 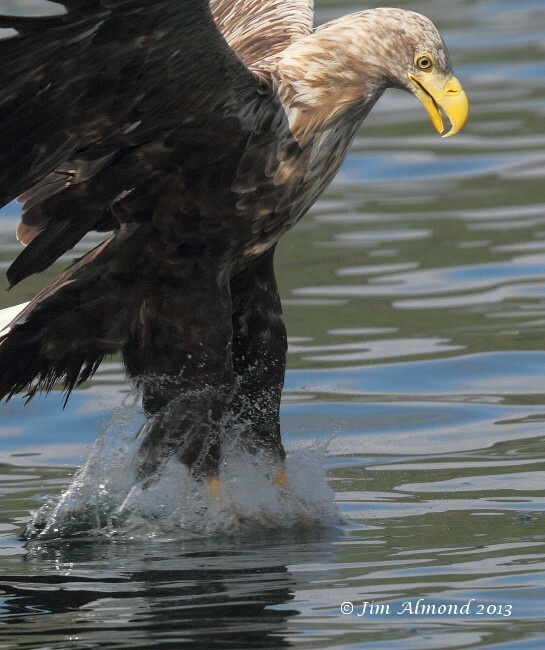 Concentrate on the final moments as the eagle nears the water for the fish – it will be over in a flash! The unpredictable nature of the birds and conditions mean that every trip is different, always remember – nothing is ever guaranteed!